Why do people behave like idiots? Other people frequently appear to behave like idiots. As is often the case, there’s a simple explanation for this, and as is also often the case, the full story is a bit more complex, but still manageably simple once you get your head round it. This model comes from the literatures on human error and on safety-critical systems; there are variations on the wording and on some of the detail (particularly around slips) but the core concepts are usually the same. Sin (or “violations” in the more common version of the name) involves someone deliberately setting out to do the wrong thing. I’ll return later to possible reasons for people doing this. Error involves people having mistaken beliefs; for example, they believe that closing a particular valve will solve a particular problem. Slips involve someone intending to do one thing, but unintentionally doing something different; for example, intending to press the button on the left, but accidentally pressing the button on the right. Students often ask what good academic writing looks like. It’s an important, simple, question. Answering it in words is tricky. However, answering it with words plus highlighter makes answering easier. The answer is that good academic writing features mainly highlighter 2, with some highlighter 1 at the beginnings or ends of paragraphs, and as little grey as possible. What does that actually look like? I’ll use a worked example to illustrate it, on the topic of the growth of the Internet. This is a difficult topic, because the key points are well known to the general public, so there’s a real risk that your opening text will look like something that a twelve year old without Internet access has hacked together at the last minute for an overdue essay. In an earlier article in this short series, we looked at what happens when you treat two concepts such as liking and disliking as two separate scales, rather than as opposite ends on a single scale. The answer was that often this makes sense of results which would otherwise look contradictory. In another article, we looked at what happens when you apply this approach to the well established literature on perceptions of attractiveness. The result was that this provided a clear, simple way of explaining an apparent paradox within the literature on perceptions of attractiveness in human faces. In a previous article, we looked at what happens when you take two concepts that are normally viewed as opposites, and instead treat them as two separate concepts. We used the example of what happens when you treat liking and disliking as two separate concepts, and ask people to rate items in relation to both liking and disliking. The result is that people are willing and able to do so. The image below shows types of response that we’ve seen in real data. Item A has been rated low both for liking and for disliking; it’s just boring, with little to be said for or against it. Item B has been rated high both for liking and for disliking; it produces strong but ambivalent feelings. An example that we saw involved university departmental websites, where some were strongly liked because they signalled high quality, but simultaneously strongly disliked because that same signal of high quality was viewed as implying unforgivingly high expectations. Item C has been rated high like/low dislike by some participants, and low like/high dislike by others. This is informally known in the UK as the Marmite effect, where people either love something or hate it, with few people in between. This approach of uncoupling apparent opposites is well established in some fields, but isn’t yet widely known outside them. We’ve been using it for a while in software evaluation, where it’s invaluable for improving software mockups before committing to the final design. We’ve also blogged about ways of using it to represent expressive and instrumental behaviour; handedness; and gender roles, going back to the literature where we first encountered it, in Bem’s work on androgyny (Bem, 1974). The advantages of using this approach are clear when you see examples. In the next section, we’ll look at the background theory on which it works. We’ll then apply it to an apparently paradoxical finding about facial attractiveness, to show how the underlying issues can be swiftly and easily teased apart via this representation. Treating liking and disliking as opposite ends of the same scale looks so obvious that few people ever think about it. They’ve been viewed as opposites since at least Classical times, when Catullus wrote about the paradox of loving and hating the same person. However, this approach doesn’t actually work very well when you try applying it systematically in contexts like surveys or evaluation or market research. There are usually pros and cons that you’re asking the respondent to compress down into a single number, and respondents usually don’t look very happy about it. 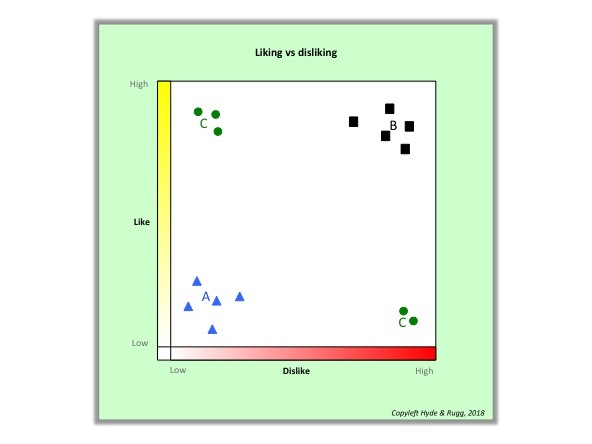 So what happens if you instead try treating liking and disliking as two separate scales? The answer is that it gives you a lot of powerful new insights, because liking and disliking are often not opposites. So what do wireframe Necker cubes have to do with enigmatic facial beauty, Rothko paintings, Sudoku, and video games? The answer is: Quite a lot. In this article I’ll look at the deep structure of some popular passtimes, and consider some of the implications. This is the first in a short series of articles about the deep structures of desire. This is a guest article by Dan O’Neill; I hope you’ll find it interesting and useful. While focus group methodology is often discussed in the context of market research, it is also used in a variety of research fields. Focus groups have been used to gather data on a wide range of research topics including: attitudes towards tobacco, meat quality, farming, electronic resources, patient quality, solar technology, health and safety, property management, and many more. If you’re thinking about conducting a focus group for your own research, below are some fundamental things you’ll need to do to prepare for this type of study.